When construction begins at Gateway Park in Bryan later this month, the plans will reflect designs made by first-year landscape architecture students led by Jodi Naderi, assistant professor of landscape architecture at Texas A&M University’s College of Architecture. Members of the Bryan City Council asked the students to consider the park a blank slate and then begin the design process. The park site is located along Main Street between 28th and 29th streets in downtown Bryan. Naderi said the piece of land presented a design challenge for the students. Above: A student model, one of several proposals submitted to the Bryan City Council, was used to help make a final design for Gateway Park. A sculpture created by visiting artist Paolo Piscitelli was installed southwest of the Langford Architecture Center. It’s a piece he created while working with students as an artist in residence. 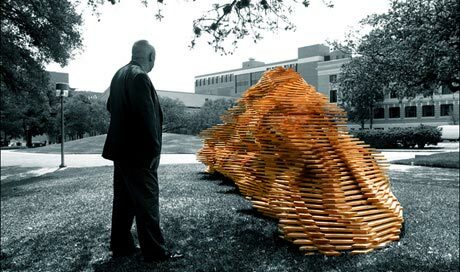 An Italian artist who wants people to look at sculpture in a different way has been working as artist in residence with students at the Texas A&M College of Architecture. The results of their efforts, an exhibit titled, “In Between the Lines,” runs through April 11 in the Langford B Exhibit Hall on the Texas A&M University campus. Terry Allen, a recording and conceptual artist whose creativity is hard to categorize, will be working with Texas A&M students April 11 - 17 as the College of Architecture’s second Spring 2008 Artist in Residence. On Earth Day the Texas A&M College of Architecture is going green. 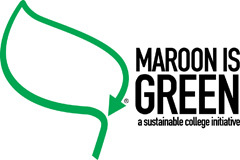 And, if the three environmentally conscious student groups who are spearheading the Maroon is Green Sustainable College Initiative have their way, the college will grow greener and greener. The students are launching the Maroon is Green initiative on Earth Day, April 22, 2008, with a college-wide celebration that includes an environmental fair, live music, sustainable living demonstrations, guest speakers and even green cuisine. Leading the Maroon is Green effort are the Texas A&M student chapters of the American Institute of Architecture Students, the American Society of Landscape Architects and Emerging Green Builders. These student groups are collaborating to promote and establish green, sustainable practices throughout the college, and most importantly, throughout the year. Ken Yeang, a pioneer in designing sustainable buildings and a professor of practice on the Texas A&M College of Architecture faculty, will visit the college April 25 for a series of closed meetings and one open session evaluating student work and discussing the future of green architecture. One of the student designs at midpoint in the semester. It was created by Mark Burgess, Shawn Dressler, Randi Newman, Cara Strong and Teri Whitney. 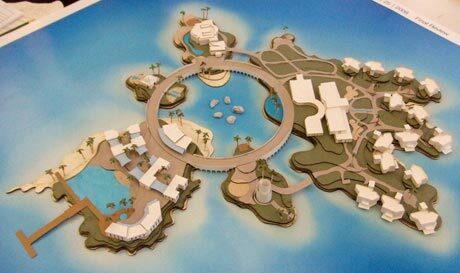 Students in Texas A&M University’s architecture and landscape architecture programs have developed design concepts for a hospital/resort in one of the world’s most unique locations — a series of man-made islands off the coast of Dubai in the United Arab Emirates. The designs will be unveiled 11:30 a.m. Friday, April 25 at HKS Inc.’s offices located at 1919 McKinney Ave. in downtown Dallas. For the project, “Destination Healthcare: A Sustainable Resort and Hospital,” 31 students and faculty members collaborated with design professionals at HKS and the SWA Group to create building and landscape designs for a hospital, hotel and villas to be located in Dubai’s World of Islands development. Student groups associated with the College of Architecture built a breezy, comfortable shack (far right) for Shack-A-Thon. Architecture students don’t ordinarily aspire to design shacks, but two at Texas A&M University did just that to help raise funds for Habitat for Humanity. The shack was part of Shack-A-Thon, a fundraiser for the Texas A&M University chapter of Habitat for Humanity, in which various student organizations built temporary homes in auctioned spaces around the Rudder Fountain. “It’s definitely the most comfortable shack here,” said architecture student Laura Crow of the shack built by students in three campus organizations: the American Institute of Architecture Students, the Design-Build Institute of America and the Emerging Green Builders. Jorge Vanegas, professor of architecture and director of the Texas A&M University College of Architecture's Center for Housing and Urban Development, received a 2008 Superior Technical Achievement Award at FIATECH's April 1 Celebrate Engineering and Technology Innovations Awards. “I was honored to have been nominated and I am very proud to have been selected to be the recipient of the award,” said Vanegas. FIATECH, or Fully Integrated Automated Technology, is an Austin-based nonprofit consortium focused on development and deployment of technologies dedicated to improving how capital projects and facilities are designed, engineered, built and maintained. Two Texas A&M University construction science professors, Ifte Choudhury and Paul Woods, received national commendation at the April 2-5 Associated Schools of Construction annual conference at Auburn University. Choudhury, associate professor and coordinator of the master’s program in construction management at Texas A&M’s College of Architecture, received the ASC’s Outstanding Educator Award. The honor recognizes significant contributions to construction education, excellence in teaching, service to the ASC and dedication to the construction profession. Woods, associate professor in construction science, received the ASC’s Outstanding Researcher Award, which recognizes significant contributions to the dissemination of scholarly work within the ASC community. “Paul has consistently disseminated the work of his many graduate students,” said associate construction science professor Richard Burt in his letter nominating Woods for the award. Burt is holder of the James C. Smith CIAC professorship and coordinator of Texas A&M’s undergraduate construction science program. The Texas A&M College of Architecture’s Preston Geren Auditorium will be turned into a swamp of sorts 7:30 p.m. April 18 and 19 when the Aggie Screenwriting, Acting, and Movie Production (SWAMP) Club presents SWAMPFest 2, its second-annual film festival. Film enthusiasts are invited to visit the dreamlike world of “Discretion,” a thesis work by Master of Science in Visualization Sciences student Vishwanand V. Shetti, which will screen 12:15 p.m. Tuesday, April 15 in Langford C414 at the Texas A&M College of Architecture. On Thursday, April 17, Shetti will present his thesis defense, also in Langford C414. Cutting-edge visual art and short special-effects laden videos and animations created by the digital wizards, or “Vizzers,” in Texas A&M’s Master of Science in Visualization Sciences program, will be showcased under the banner of “TechnoBabel,” at the 15th annual Viz-a-GoGo. The main event, screenings of time-based student work, will be held 7 p.m. Friday and Saturday, May 2-3 in Rudder Theatre on the Texas A&M campus. Prior to the screenings, 4 – 6:30 p.m., students will provide short talks and demonstrations of their thesis projects in the Rudder Exhibit Hall. The students will provide a “behind the scenes description about how something is done, or made to look a certain way,” said Karen Hillier, a professor in the Department of Visualization at the Texas A&M College of Architecture. Additionally, April 26 – May 3, an exhibition of visualization student work will be on display at the Rudder Exhibit hall 8 a.m. – 5 p.m. There is no charge for Viz-a-Gogo and events are open to the public. Underlying the “Technobabel” theme, is the ”idea that current technology is a grand experiment that we’re all a part of,” said Hillier. “The idea is to join the experiment; you are part of the experiment.” She added. Viz-a-GoGo 15 patrons will see animations, multimedia work, videos, work from physically based modeling classes and much more. Mulholland’s studio light shows have become a popular, much anticipated event at Texas A&M. This semester, the show is moving from its previous venue at the college’s Langford Architecture Center to the Built Environment Teaching and Research Facility, or “Architecture Ranch,” at Texas A&M’s Riverside Campus. Mullholland said this location provides students more room for their projects as well as the option to use the ranch’s digital fabrication, woodworking and metalworking equipment. Before being depicted by graduate visualization students at Texas A&M University, snack machines appeared to be the very definition of banal. 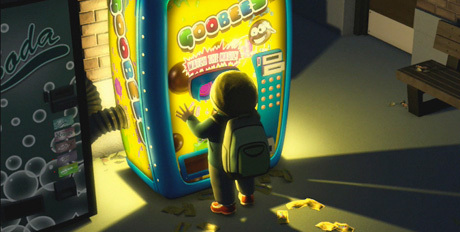 But in their computer-animated movie “Goobees,” the students showed a snack machine having an inner, wild world of candy at war, with battle losers ending up as edible products for unsuspecting humans. The students’ fun and somewhat sinister work has earned them a place in the prestigious SIGGRAPH 2008 Computer Animation Festival competition. SIGGRAPH is an organization composed of a diverse group of researchers, artists, developers, filmmakers, scientists, and other professionals who share an interest in computer graphics and interactive techniques. Students taking Law I classes ­­­­­­­through the Department of Construction Science at Texas A&M University’s College of Architecture got a firsthand look at the Texas State Supreme Court in action during a recent trip to the state capital. “It was a real cool experience, seeing the chief justice and the other eight presiding justices,” said Mitchell Cordoba, one of the approximately 80 students on the trip. 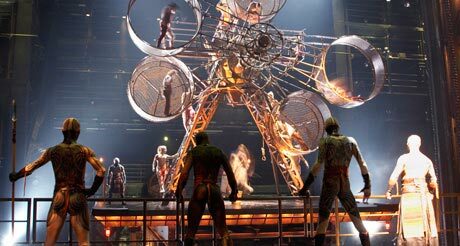 Three Texas A&M College of Architecture graduates have literally run off with the circus—not just any circus, but the world-renowned Cirque du Soleil, the Montreal-based company whose spectacular shows dazzle audiences worldwide with high-tech sets and the gravity-defying routines of its performers. Jon Mytyk ‘01, and Joann McKee ‘03, received Bachelor of Environmental Design degrees from Texas A&M’s Department of Architecture and are working on Cirque’s newest show, which is being created in a new, custom-built theater in the People’s Republic of China Special Administrative Region of Macau, 40 miles west of Hong Kong. The theater is in the Las Vegas-style Venetian Macao resort on Macau’s Cotai Strip, a master-planned development of resorts and casinos. Mytyk is the show’s head of projections, and McKee is a technical department coordinator. April 11-13, the College of Architecture will join the Texas A&M campus community in hosting Parent’s Weekend, a university tradition that dates back to 1919. The springtime celebration this year begins Friday and includes the annual Aggie Moms' Boutique, concerts by the Singing Cadets and Women's Chorus, an open house at the home of the university vice president for student affairs on Saturday and concludes Sunday with the presentation of a host of awards and naming of the Aggie Parents of the Year. The College of Architecture will welcome students’ families at 9 a.m. Saturday. The morning agenda begins with registration, breakfast and orientation at the Langford Architecture Center. A second, break-out session will allow parents to meet with representatives for their son’s or daughters chosen discipline. Representatives from the architecture and visualization departments will be in Langford C105, construction science will visit with parents in C207 and landscape architecture and urban planning in C307. 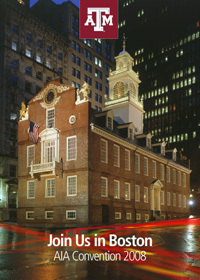 The Texas A&M University College of Architecture will host former students, faculty, and friends of the college and the Department of Architecture at an alumni reception May 16 at The Old State House in Boston during the 2008 American Institute of Architects National Convention. Built in 1713, the Old State House is the oldest surviving public building in Boston, and the seat of the first elected legislature in the New World. It’s located on 206 Washington St. along the Freedom Trail, a path in downtown Boston that leads to historic sites. Those planning to attend the Aggie reception at the AIA convention are urged to RSVP by May 7, 2008 to Melinda Randle at 979-847-8918 or mrandle@archone.tamu.edu. The Texas A&M College of Architecture is phasing out the class folder system currently setup on the college server and used for class content delivery in favor of Vista, formerly known as WebCT. The current folder system will be available through the summer 2008 semesters, but will be shut down prior to the start of the fall 2008 semester. Before the final transition in the fall, the college will arrange Vista training for all interested faculty. “Between the Lines” art exhibit of Paolo Piscitelli, spring artist-in-residence, and his students’ work will be on display in the Langford B Exhibit Hall. For more information, contact Mary Saslow at 845.7073 or saslow@viz.tamu.edu. LAUP Scholarship Banquet: The Department of Landscape Architecture and Urban Planning celebrates student achievements and awards scholarships at the Briarcrest Country Club 6 – 10 p.m. For more information, contact June Withers, 845-1046 or jwithers@archmail.tamu.edu. Visiting Artist Terry Allen’s work will be on exhibit in Langford B Exhibit Hall. He is also teaching a workshop during his stay entitled “Ideas, Looking For a Source”. He invites “any visual artist, writer, musician, actor, etcetera, who might wish to explore areas they may not have explored before.” For more information, contact Mary Saslow at 845.7073 or saslow@viz.tamu.edu. Society of Women in Construction student chapter will meet 7 – 8 p.m. in Langford A room 107B. For more information, contact Zara Perciful at za.perciful09@yahoo.com. Artist in Residence Lecture by Terry Allen will take place 12:30 – 1:30 p.m. Preston Geren Auditorium. Allen is a recording and conceptual artist whose creativity is impossible to categorize. Dabbling in and finding success in a wide range of activites from music and drama to art and multimedia his unique take on the creative process is sure to interest any student. For more information, contact Mary Saslow at 845.7073 or saslow@viz.tamu.edu. Thesis defense by Vishwanand V. Shetti on his film “Discretion” 12:15 – 1:30 p.m. Langford C414 (The Curved Classroom) Disclaimer: the defense contains mature subject matter not suitable for younger viewers. American Institute of Architecture Students meet 6:30 – 8 p.m. in Langford C105. For more information, contact Amanda Scott, ag00d@tamu.edu. A Management Student meeting will be held 5 – 7 p.m. in Langford C305. For more information, contact Susie Billings, 979-847-9357 or sbillings@archone.tamu.edu. Lecture eyes Friesen Concepts: Larry Lammers, president of Lammers and Gershon Associates of Reston, Va. presents “The Friesen Concepts — The Impact on Today’s Hospital Design,” an Architecture-for-Health lecture sponsored by the Center for Health Systems and Design and the Student Health Environments Association in Langford A205 at noon. Student photo exhibit: 16” x 20” mounted images taken by students in Howard Eilers’ ENDS 311 classes will be on display in Preston Geren Auditorium 7 – 9 p.m. For more information, contact Howard Eilers, 979-845-4685 or h-eilers@tamu.edu. “Discretion,” Thesis Film by Vishwanand V. Shetti will be shown for free with refreshments provided for the audience if you get there early 12:15 – 1:30 p.m. Langford C414 (The Curved Classroom). Disclaimer: the screening contains mature subject matter not suitable for younger viewers. Annual Film Screening by Aggie SWAMP Club (Screenwriters, Actors, Movie Producers), this end-of-year event is for movies by members as well as any movies created by other A&M students 6 – 11 p.m. in the Preston Geren Auditorium. For more information, contact Carol LaFayette at 845.3465 or lurleen@tamu.edu. Architecture/Engineering — Bridging the Gap: Roger Ridsdill-Smith, an architect with Arup and Partners in London, will present “Bridging the Gap Between Architecture and Engineering” 5 – 7 p.m. in the Preston Geren Auditorium of the Langford Architecture Center. Ridsdill-Smith was the project director for London's Millennium Bridge, the first pedestrian river crossing over the Thames River in central London in more than a century. The lecture is part of the Spring 2008 Department of Architecture Lecture Series. For more information, contact Malcolm Quantrill at casa@archone.tamu.edu. See related story in the archone. newsletter. Maroon is Green kick off, is a fun-filled Earth Day to start the Texas A&M College of Architecture’s sustainable college initiative. The event will be held all day in the Langford Architecture Center and includes an environmental fair, live music featuring The Flyers, sustainable living demonstrations, guest speakers and green cuisine. To participate in the planning as a volunteer, or reserve booth space for your group, contact Lindsay Trussell at 862.8332 or ltrussell@archmail.tamu.edu. 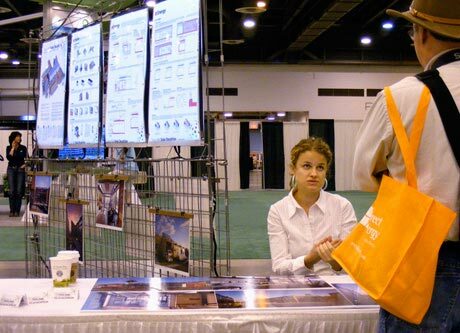 Or talk to a member of these student organizations: American Institute of Architecture Students, American Society of Landscape Architects, and Emerging Green Builders. “Project Management and Planning,” a lecture by Paul Sanders of Broaddus & Associates, is set for noon in Langford A205. The presentation is part of the ongoing Architecture-for-Health Lecture Series sponsored by the Center for Health Systems and Design and the Student Health Environments Association . Construction Science Awards Banquet: The Department of Construction Science will award scholarships and celebrate student achievement 4:30 – 11:30 p.m. at the College Station Hilton. For more information, contact Ann McGowan, aeastwood@archone.tamu.edu. Architecture Awards Banquet: The Department of Architecture will award scholarships and celebrate student achievement 6 – 10 p.m. at Pebble Creek Country Club. For more information, contact Melinda Randle, 979-847-8918 or mrandle@archone.tamu.edu. Student lighting projects will illuminate the College of Architecture’s Architecture Ranch 9 p.m. when students in Jill Mulholland’s architecture studios display their lighting installations for final review. For more information, contact Jill Mulholland at 779.7373 or jmulholland@archmail.tamu.edu. High School Leadership Conference hosted by the Texas A&M University student organization FLiP(Freshman Leaders in Progress) 8 – 5 p.m. in the Preston Geren Auditorium and Exhibit Hall as well as various rooms in Langford Building C. For more information, contact Ginger White 458.3042 or gwhite@tamu.edu. Quantrill on “Material & Otherness: Malcolm Quantrill, distinguished professor of architecture at Texas A&M and director of the Center for the Advancement of Studies in Architecture will present on “Materiality and Otherness: Architecture as a Vision Beyond Seeing,” as part of the Department of Architecture lecture series from 5 – 7 p.m. in the Preston Geren Auditorium. See related story in the archone. newsletter. Student Artwork on Exhibit: Students enrolled in ENDS 489, ENDS 205, ARTS 203, ARTS 304, ARTS 305, ENDS 311, and ENDS 312 will exhibit still works in the Langford A atrium. For more information, contact Terry Larsen, 979-845-7068 or trl@archone.tamu.edu. American Institute of Architecture Students meets 6:30 – 8 p.m. in Langford C105. For more information, contact Amanda Scott, ag00d@tamu.edu. Student Animation Screening: Students enrolled in ENDS 489, ENDS 205, ARTS 203, ARTS 304, ARTS 305, ENDS 311, and ENDS 312 will exhibit time-based work 5 – 8 p.m. in the Preston Geren Auditorium. For more information, contact Terry Larsen, 979-845-7068 or trl@archone.tamu.edu. The Texas Society of Architects’ 2008 convention will be held in Fort Worth. Facility Management Industry Advisory Council will meet in Room 292 of the Memorial Student Center on the Texas A&M University campus. For more information, contact Susie Billings at 847.9357 or sbillings@archmail.tamu.edu. 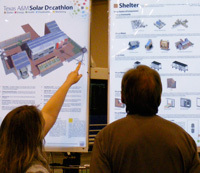 Texas A&M architecture students offered information on the Aggie Solar Decathlon home at the inaugural Houston Green Expo held April 5-6, 2008, at Reliant Park in Houston. “We’ve had a lot of positive feedback,” said Andrea Pimentel, a bachelor of environmental design student. She and fellow BED student Eva Peterson talked about the home to a steady stream of expo visitors, aided with informational posters and photographs of the project. Pimentel and Peterson were two of the students who made the trek to Washington D.C. for the U.S. Department of Energy’s 2007 Solar Decathlon competition. “It was a lot of work, but a lot of fun, too,” said Pimentel. The free event was hosted by Gulf Coast Green and the city of Houston and featured five themes: green building, energy efficiency, renewable energy, alternative transportation and the Green the Gulf Coast Youth Initiative.